Liverpool fans are not enjoying this week football wise, following our 4-1 humbling by Spurs at the weekend. 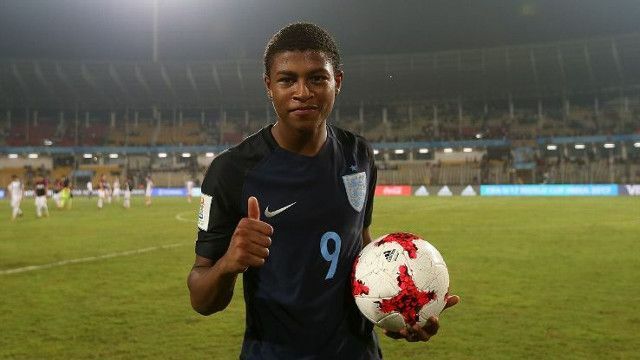 But we do have one reason to smile in Rhian Brewster, who believe it or not, has just scored a hat-trick for England in the Under-17 World Cup semi-final against Brazil! Our teenage starlet finished expertly on three occasions and supporters on Twitter have gone ballistic. It’s Brewster’s second hat-trick of the tournament, meaning he’s on course to win the Golden Boot. Liverpool have been crying out for a goal poacher this season, unable to convert simple chances while messing up defensively at the back. Many believe Brewster should be getting a chance, but with Roberto Firmino, Daniel Sturridge and Dominic Solanke currently ahead of him in the pecking order, we don’t think first-team minutes are round the corner. These lot on the other hand, do! Mbappe is the French Brewster. Don’t like to overreact on some young players but not even Messi was this good at Brewster’s age. Dominic Solanke won player of the tournament at the U20 World Cup and surely Brewster will do the same at this level. The future is bright.